It's here! My favorite polish subscription service. 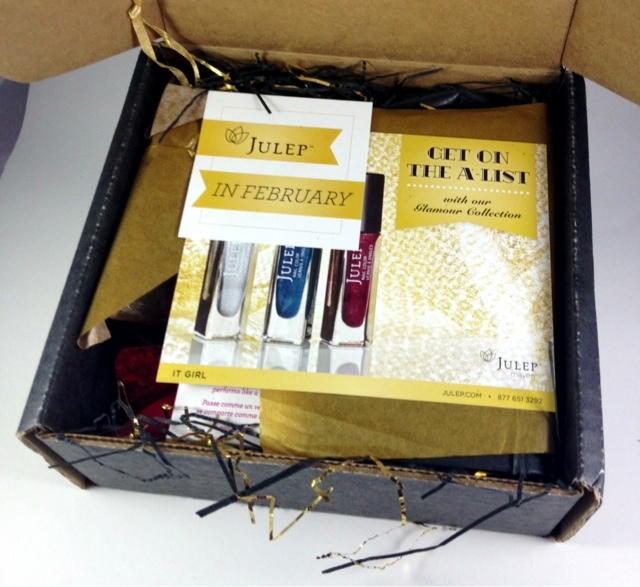 For the February Julep maven month, the collection is Glamour! I was so impressed with the shades for this month and I feel they are back on track after last months box which was an okay box. I am usually a Bombshell but this month I had to go with the It Girl box. I added the Oxygen Nail Treatment product as an extra so I could try this months product out too. First look! There is a gold and black theme going on in this box. I have an insert with this months quote and an insert with my It Girl colors. "Be yourself. The world worships the original." - Ingrid Bergman. There is a bed of gold and black paper cushioning a little baggie with this months extra, the Freedom Top Coat extra, polishes are wrapped in a black bag with a gold ribbon, there were two added chocolate hearts and everything was wrapped in gold paper. 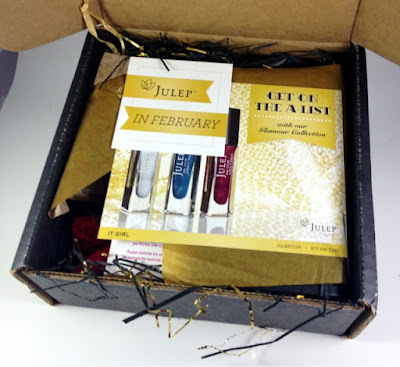 In my box I got Julep Rebel, the Freedom Top Coat, the Julep lash curler, Julep Joan, Julep Marion and the chocolate hearts. The surprise extra was this adorable portable lash curler! You just flip down a handle and the curler is all set to go. This will be a great little addition to my makeup collection. I started out with Joan. This is a raspberry plum base with rose gold shimmer. Unlike regular shimmer this is a flaky shimmer! Flaky polishes are my absolute favorite so I'm very excited with this polish. This is two coats. 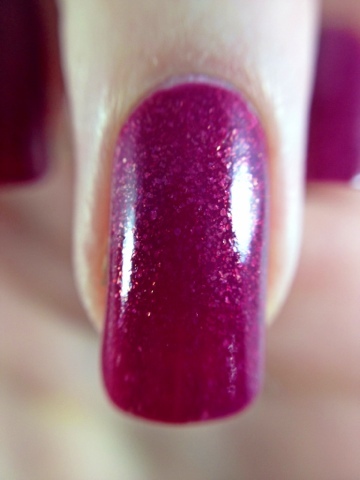 The raspberry base is the slightest bit sheer allowing you to see the nail line slightly. The gold flakies have great coverage and reflect back a bright gold with great intensity when it catches the light. I love this polish and I am so pleased I got it! 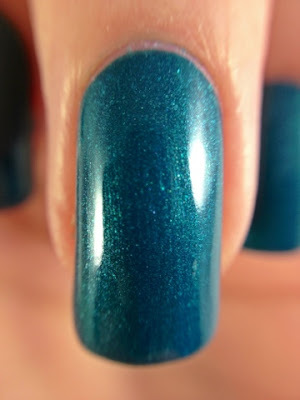 Julep Marion is a smokey blue with silver shimmer. This is shimmer is the traditional type. In two coats I had full opaque coverage. The blue is a beautiful hue and I can see this polish matching almost everything in my wardrobe. The silver and blue complement each other perfectly! Last but not least we have Julep Rebel. This is why I switched to the It Girl box this month. I love my holographic polishes and silver is my favorite shade. 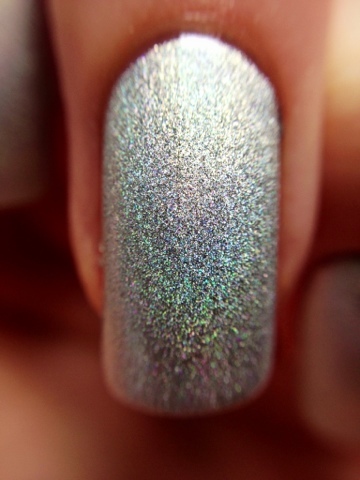 Unlike other holos I have tried in the past, the coverage of this was fantastic! Two coats covered the whole nail evenly and beautifully. The holo is slightly scattered. In shade you will have a metallic looking silver nail but in sunlight or direct light you will get rainbow reflections on every nail! Check out the rainbow arc towards the bottom of the nail in the macro shot to see a little bit of what I'm talking about. The Julep Freedom Top Coat is one I tried over a Valentines Day mani. It is described as a top coat that cures in 5 mins and will rival gel top coats without actually being gel polish. This top coat does smell strongly but when you get over that fact WOW! It goes on thick but still liquidy so this would be a fantastic glitter topper. It dried incredibly fast and gave me a super glossy shine. I was very impressed and so excited this was a free gift in every box. I may have to purchase some more bottles! My extra product I ordered was the Oxygen Nail Treatment. 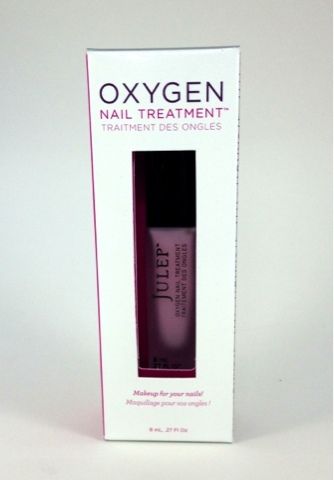 This treatment is said to use oxygen technology to allow nails to breath while also conditioning and restructuring your nails to be stronger. There is a UV filter in the formula and it is not supposed to be used with any other polish. Boo! When I had ordered this I planned on using it as a base coat but since it won't work with other polishes I'll probably include this in a giveaway or contest prize. Overall I am super pleased with this box. Rebel, Joan and Marion all held their own but Rebel is my stand out favorite! 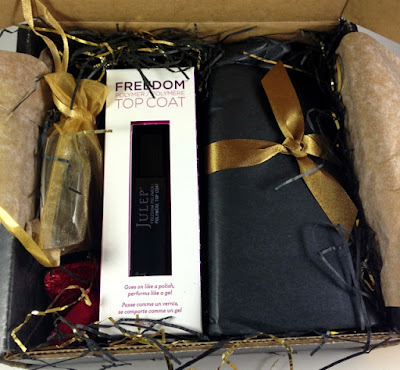 The Freedom Top Coat is fantastic and the lash curler was a perfect addition this month. A+ Julep! 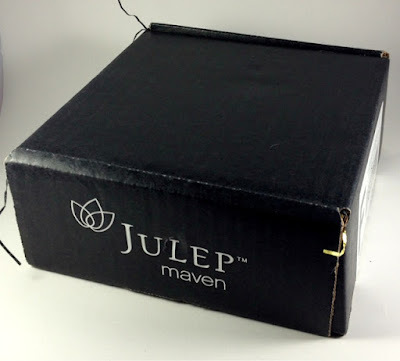 Did you guys hear what Julep did for one maven this month? Each month you can upgrade your box to the entire collection for $50-$55. Dipped in Lacquer upgraded her box this month to the entire Galamour Collection. Julep called and asked for her shoe size for a surprise. A week later she got a box containing a brand new pair of Louboutins from Julep! Just because! Julep didn't even promote or announce this deal they were just being fantastic. This is why I love being a maven! If you'd like to become a maven it is easy to sign up and you can try out your first maven box for only 1 cent to see how you like it. After that boxes are $19.99 a month. If you don't like it you can always cancel and keep your starter box at no extra charge. 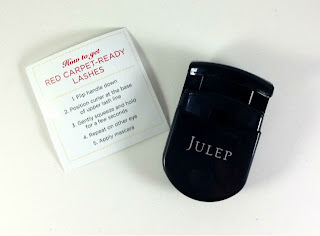 To get your 1 cent box click on this link and take the Julep style quiz. At checkout use the code JULEPVIP to get your box reduced to 1 cent. This is a limited time offer so jump on this practically free polish!